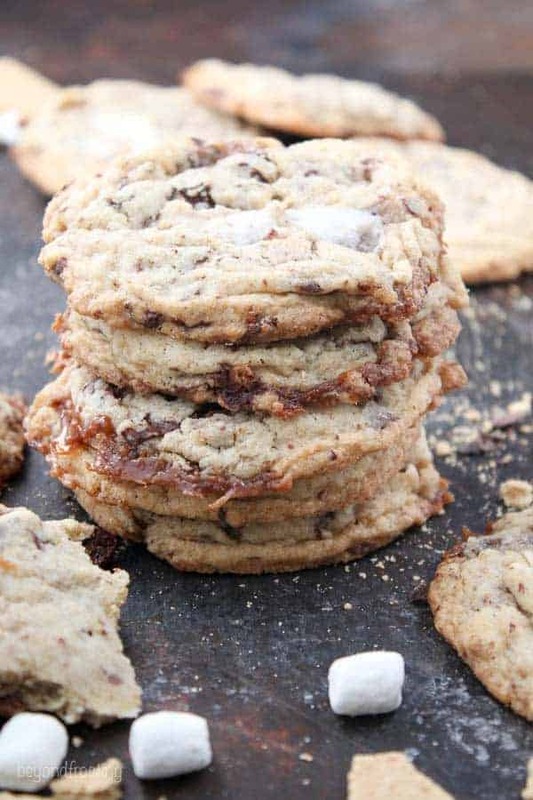 These Soft and Chewy S’mores Cookies are loaded with gooey marshmallows and chocolate shavings in every bite. 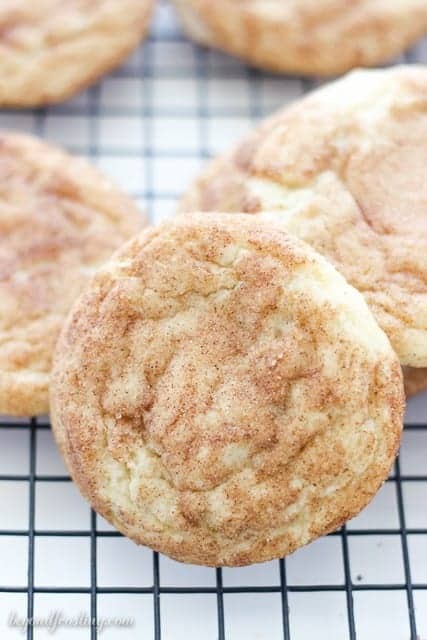 The homemade cookies have graham cracker crumbs which makes these cookies so soft and buttery, they melt in your mouth. 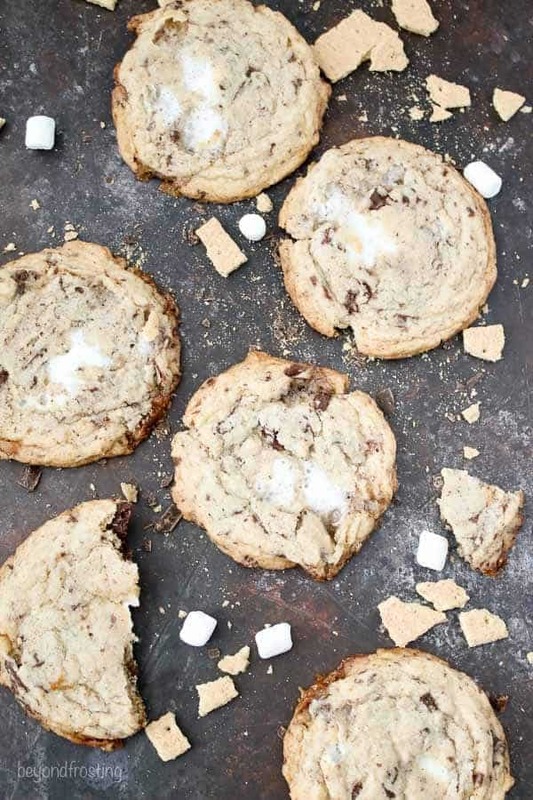 Did you know August 10th is National S’mores Day? I’m so prepared every year, look at me! 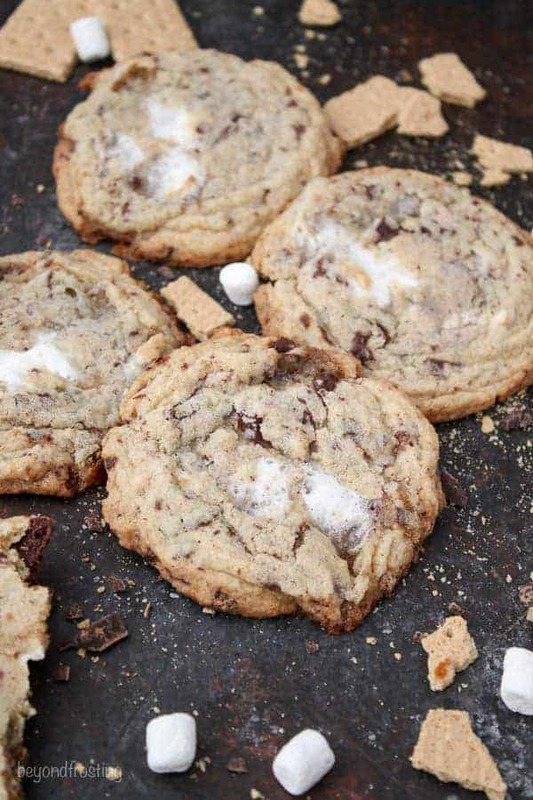 Have you ever met someone who doesn’t like S’mores? I mean I suppose it’s a possibility that you might hate sticky fingers, but I can’t see any other reason. My favorite way to enjoy a S’mores is with a DIY S’mores Fondue bar. 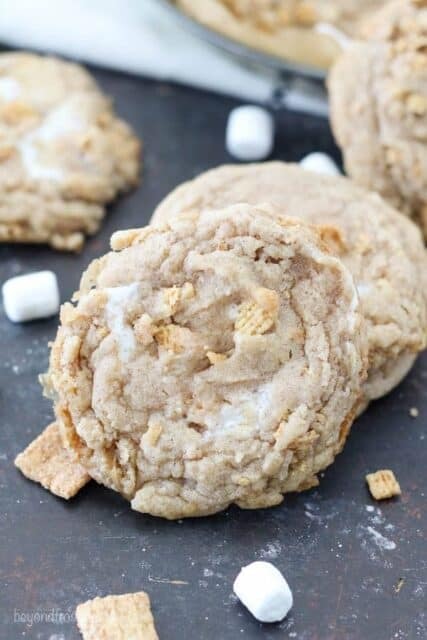 There’s so many ways to dress up your marshmallow and graham crackers, you can’t really go wrong. 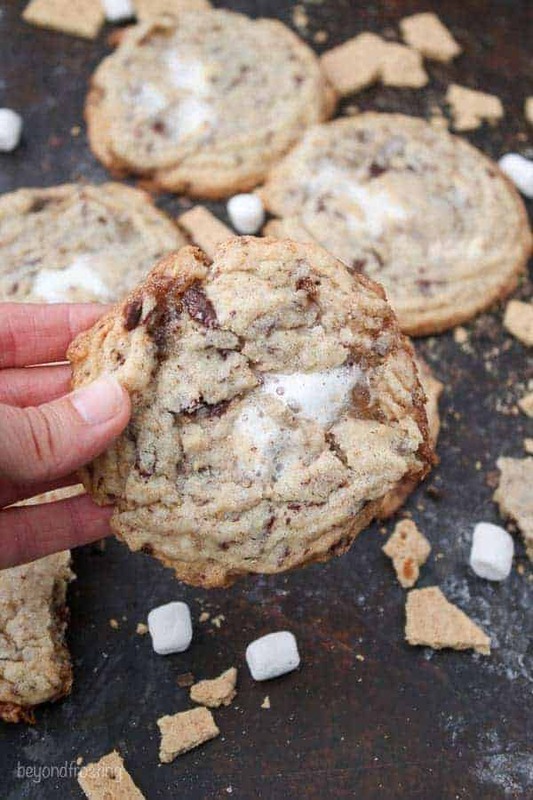 But if you’re looking for something simpler that you can make at home, start with these Soft and Chewy S’mores Cookies. Even though I have a S’mores Cookie Cup, I don’t have a basic S’mores cookie. 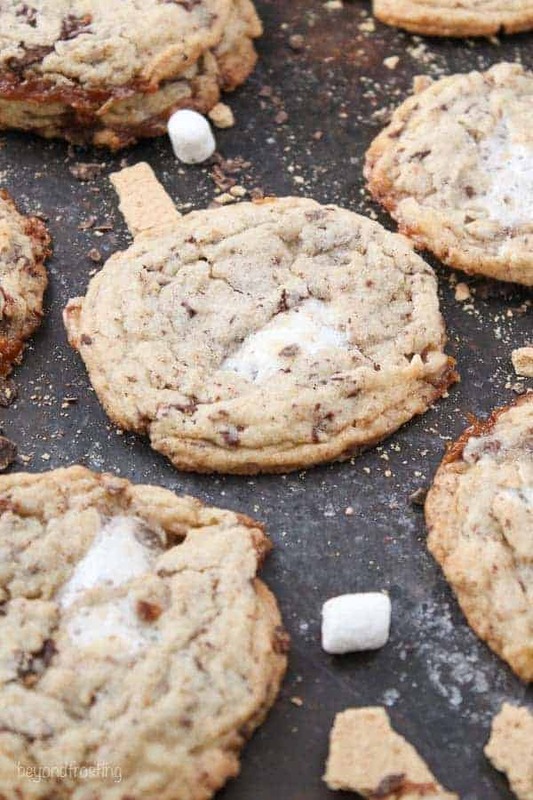 That’s where these Soft and Chewy S’mores Cookies started. 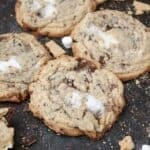 This recipe is based on my master soft and chewy cookie dough recipe. 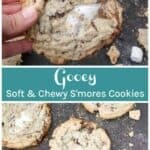 It’s loaded with chopped chocolate and gooey mini marshmallows. The reason I decided on chopped dark chocolate instead of chocolate chips is because I prefer every bite to have chocolate in it. Can you blame me? I mean chocolate chips work fine here to, but the chopped chocolate is just the BEST idea! When I was testing this recipe, I made it several ways. I tried adding some graham cracker crumbs to the dough, while in another variation I tried adding chopped graham crackers. The third version I tested, I placed a half of a graham cracker underneath the scoop of cookie dough. The final version I chose was to add the graham cracker crumbs to the cookie dough. This adds a sweet, buttery note to these cookies and also baked the most evenly. I like the variation with the chopped graham crackers too, but they just weren’t the prettiest cookies. The third version with the graham cracker under the cookie dough baked quite weird just because the graham cracker blocked some of the heat from the base of the cookie. 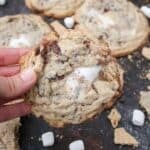 Since this recipe is loaded with mini marshmallows, you might have cookies with those glorious chewy sugar edges from the melted marshmallows. Those are my absolute favorite! If your cookie is really misshaped when you pull it out of the oven, go ahead and take the flat edge of a knife and push the edges of the cookie back towards the centers. It’s best to do this right when they come out of the oven. This dough can be made as a full of half batch, the recipe here is for a half batch. For a full batch, if you want large cookies, use a large cookie scoop (about 3 tablespoon size) and you’ll get 24 cookies. For smaller cookies, use a medium size cookie scoop (about 1.5-2 tablespoons) and you’ll get about 36 cookies. Baking times vary by 2-3 minutes. It is essential that you put the cookie dough in the refrigerator for a minimum of 30 minutes, but the longer the better. It’s best if you pre-scoop your cookie dough, then you can just pull them out to bake. I prefer to leave these cookies slightly under-baked when I pull them out of the oven. The edges and bottom of the cookies are cooked, but the middle is still a touch soft. Once they cool, the middles stay so chewy. 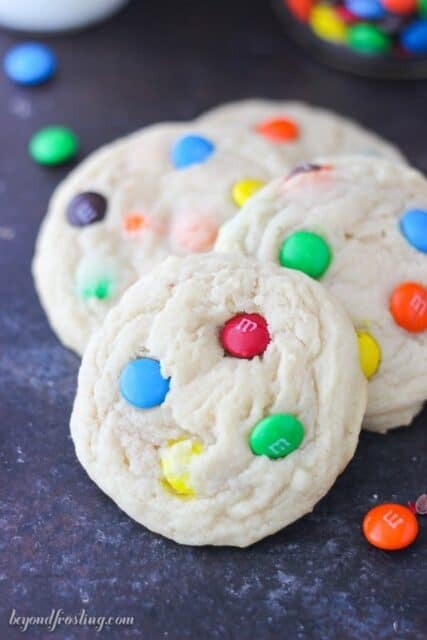 These cookies spread and are a little flat, but I promise you, these cookies are worth EVERY bite! Combine the butter and sugar and beat on medium speed until well creamed together. Add the egg and vanilla extract. Mix into butter and sugar until the egg is well beaten. In a separate bowl, combine flour, graham cracker crumbs, baking soda and cream of tartar. Slowly add into dough and beat on medium low speed until well combined and dough starts to form. Next add the chopped chocolate and mini marshmallows and mix to combine. Use a large cookie scoop (3 tbsp) and scoop cookie dough onto a parchment paper lined baking sheet. Refrigerate the dough for a minimum of 45 minutes, but the longer the better. Preheat the oven to 350° F. Place about 2 inches apart and bake at 350° F for 11-13 minutes. Allow cookie to cool on the baking sheet for several minutes and then transfer to a wire rack to cool completely.